Has Tukaram Omble already been forgotten? 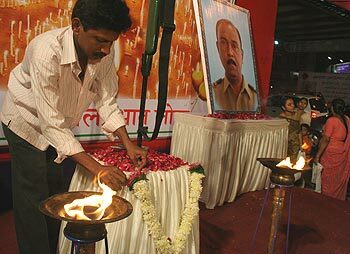 Harish Kotian located the spot where the brave police officer laid down his life, almost isolated during the anniversary of the Mumbai terror attacks. Hero today, forgotten tomorrow! That seems to be the case with Assistant Sub Inspector Tukaram Gopal Omble who helped capture terrorist Ajmal Kasab during the last year Mumbai terror attacks. Omble lost his life in the scuffle. At a homage function for Omble in Mumbai on Thursday, mediapersons and politicians were conspicuous by their absence as most of them were seen jostling at plush spots like the Taj, Trident Hotel and Cafe Leopold. The place where Omble gave his life wore a deserted look in comparison. Only a handful of people were there -- mostly comprising relatives and ex-colleagues. On that dreaded night, Omble, 48, helped nab Kasab despite being felled by a hail of bullets. Armed with only a baton, Omble pounced on Kasab and did not let him escape at the police barricade at the Girgaon Chowpatty. The brave officer tried to disarm the terrorist by grabbing his gun. 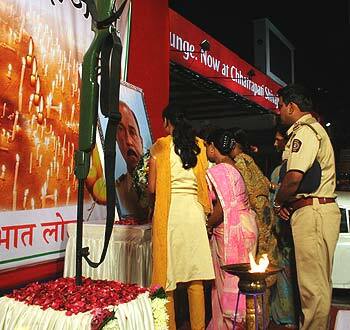 Kasab fired, but Omble was firm, enabling other policemen to overpower him. Looking back, that was no ordinary feat. If it was not for Omble's courage, India would not have had the sole terrorist alive -- the only source of information about the audacious terror attack in the country's history. The nation may have forgotten, but the family did not -- and can't. 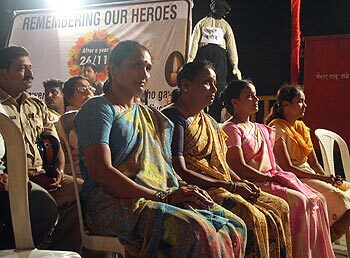 Omble's wife Tarabai and daughters came to Chowpatty, the same spot where Omble was killed. Inspector Sanjay Govilkar, who was then with Omble during the incident, said his act of bravery saved every other policeman then. "I must say that today I am alive because of his act of bravery. He was a fearless policeman and we are very proud of what he has done. Thanks to his bravery, Kasab was caught alive," Govilkar said. The function -- organised by the Bharatiya Janata Party -- urged the government to hang Kasab, instead of wasting crores of rupees on his security upkeep. "It has been a year since Omble died, but his family cannot rest in peace because his killer is still alive. Worse, he is being provided with biryani in the jail. Kasab should be hanged immediately. That is what every Mumbaikar wants," said a local leader. 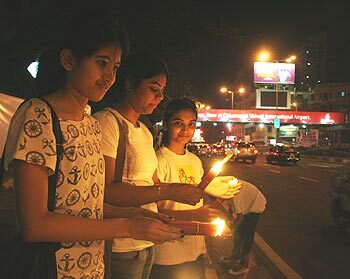 The Mumbai Catholic Samaj lit candles and held banners along the Chowpatty Road at Marine Drive in memory of the terror victims. "Their sacrifices will never be forgotten and that is what we want to show," said a member.